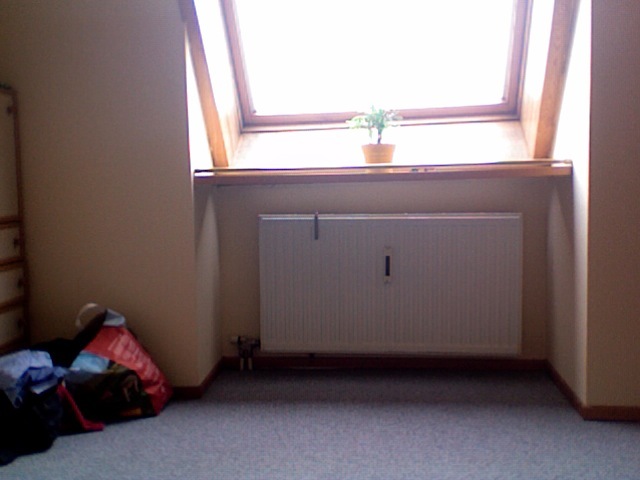 Some might call it squatter-chic. Most will just see it as the moving-in stage of two former students who are still living on a student budget but are no longer living in a small, student-oriented community with an easily-accessible secondhand store and occasional abandoned furniture on the roadsides ripe for the taking. The main purpose of any living room is clearly for extended dance parties and cartwheels, and so we’ve kept the space inviting by eschewing the typical couch, chairs and/or carpet in favour of nothing at all. Our potential future guests will, of course, be more than happy to recline on the (more or less) clean wood floors. But most of their time here will be spent dancing. Make sure to take note of the lone plant in its yellow pot (purchased on Sunday) and the sad pile of laundry in the paper bag on the left – your decor is all in the details! Such carefully placed items will act as the focal points of the room, really drawing attention to the vastness of the space around them. Furniture is overrated, and most apartments have way too much of it. Who needs a bed when you have wall-to-wall grey carpet of questionable cleanliness? I prefer a simple end table in the center of the room. It creates a dramatic effect, especially when the entire space is filled with a sunset glow. As for decoration, why insist on cluttering the visual field with multiple posters or framed photos? This will only mute the intended effect of your minimalist layout. 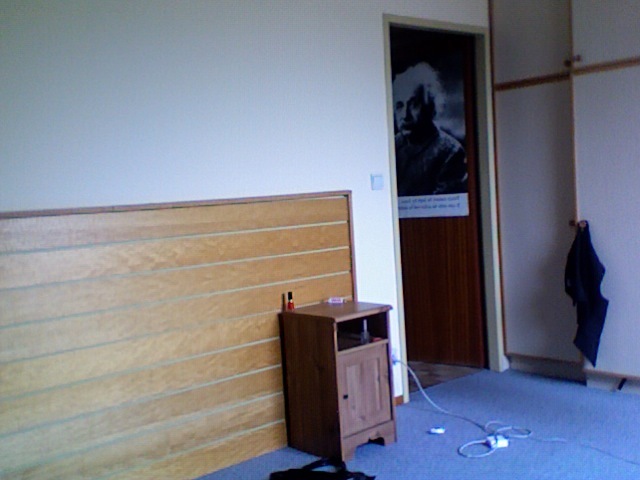 The one poster of a smirking Albert Einstein left behind by the previous tenant is much more aesthetically stunning. I think we’re on to something fantastic here. But I still can’t wait until IKEA delivers my bed.